Many years ago, I attended a Microsoft conference. Some key questions were raised about mobile phone technology emergence such as, “What will the future phone look like? Is it a PDA (personal digital assistant such as the Palm Pilot…remember that?) with voice feature, or a regular cell phone showing data on a tiny screen?” The answer as we know today is all of the above. At the time, talking on a handheld device such as the HTC device looked funny, but no more. Now a new question. What will the medical technology emergence look like? We see hospital rooms with lots of electronic devices next to the patient’s bed. With so many cables and tubes, I worry if one of those was to be unplugged by accident, what kind of harm would it cause? What kind of alarm would it sound? Or worse…would there be an alarm? 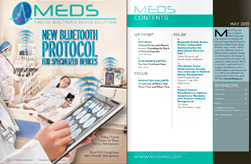 In this issue, the publisher of MEDS, John Koon, interviews Mary Logan, president of the Association of Advancement of Medical Instrumentation (AAMI) to get some answers. Publisher: What is AAMI’s vision? Mary: AAMI is an organization that supports the healthcare community in the development, management and use of safe and effective technologies. Its main focus is to be a neutral and honest broker while working with many diversified groups of medical professionals to improve patient care using technologies. To be a preferred source for high quality and objective information on clinical technology and related issues. A key project we are working on now is “alarm safety.” This covers a broad range of medical alarms that alert the caregivers in the event that a patient’s monitoring device gets disconnected. Alarm issues are huge, and require a multi-disciplinary, systems oriented approach that requires industry, clinicians and experts to work together in a collaborative way. AAMI offers that platform for discussion. We just held a major summit on this topic. To develop consensus-based medical device standards within the medical community. To help the healthcare system address system issues. Our healthcare system is a complex system. In the case of a hospital, it is no longer enough for the patients to have just the presence of doctors and nurses. The interaction of medical equipment/systems is a part of the bigger system and it can pose challenges. Our goal is to clarify the problems and to provide solutions for those involved. This is still in a very early stage. To define the professional standards and qualifications of the clinical and biomedical management and their role in healthcare. In a hospital, usually there is a department called clinical engineering that assesses, maintains and repairs the medical technologies. We want to help them to make this a profession instead of just a trade, for example by providing educational standards and support. Publisher: What are the biggest challenges in the healthcare industry today? Additionally, what solutions will AAMI provide? Mary: The convergence of healthcare electronic devices and IT poses the biggest challenge. Health care systems are making a huge push to achieve “meaningful use” for implementing Electronic Health Records (EHRs), and one of the key steps in that push is connectivity. Real “meaningful use” requires the ability to push data into an EHR from clinical devices. New entrants into this field from the traditional IT space are unfamiliar with the regulatory arena and what is required for patient safety. Patient safety with technology is at the heart of our work. We also help companies and organizations that are new to the medical electronic device field to get the right education, for example on compliance with the FDA’s quality system regulation. Publisher: What is AAMI’s focus in relating to medical electronic devices and technologies? Mary: We have over 120 standards committees actively doing international work on ISO, IEC, and ANSI standards for a wide range of medical devices (e.g., implantables; infusion devices; dialysis equipment) and horizontal (across all devices) issues like electrical safety and biocompatibility. Additionally, we work extensively with processes, like sterilization and the quality system standard, and the 80001-1 standard. We also have become more issue-oriented, like our new work on alarm safety. Publisher: How many members does AAMI have today? Mary: We have 6200 worldwide. Publisher: How does AAMI cooperate with other medical electronic device organizations in North America and internationally? Mary: We work hard to be collaborative. In the past two years I’ve had outreach meetings with 60 organizations. Some of our corporate members are very active in other organizations so that makes outreach easier. Publisher: We certainly think patient safety is very important. Bridging the gap between that and technology is a major need today. We want to keep in touch and to hear more about your work in the upcoming months.